It's been a crazy couple of days of rain. Forecasters say it's mostly over, although we can expect some rainfall through Saturday. 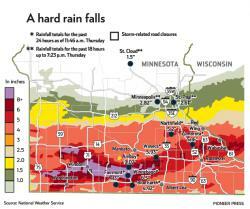 But rain upstream swells the rivers downstream, and flood watches and warnings are in effect for much of Minnesota. Here in downtown St. Paul, the river is expected to rise about ten feet over the next week. 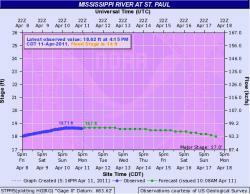 The Flood Warning continues for the Mississippi River at St Paul. At 10:15 am Friday the stage was 6.8 feet. Forecast... rise above flood stage by early Wednesday morning and continue to rise to near 16.4 feet by early Friday morning. Impact... at 18.0 feet... Warner Road may become impassable due to high water. Impact... at 17.5 feet... Harriet Island begins to become submerged. Impact... at 17.0 feet... secondary flood walls are deployed at St Paul Airport. Impact... at 14.0 feet... portions of the Lilydale park area begin to experience flooding. Flood history... this crest compares to a previous crest of 18.4 feet on Mar 24 2010." Still with me? 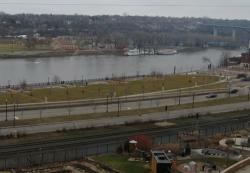 Then check out Buzz coverage of the March 2010 flood along the Mississippi. I just saw a video of how and why giant tubes of water are better than sand bagging to protect homes against flooding (click link to see video). 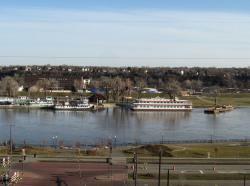 I took this photo of Harriet Island in St. Paul on Monday, March 15, 2010 in anticipation of the rising waters of the Mississippi River. The flood forecast seems to change daily, if not hourly. 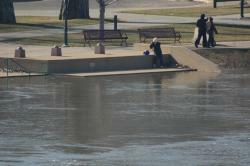 As of Sunday morning, March 21, 2010 NOAA had the river at 16.3 feet, well above the 14 foot flood stage. 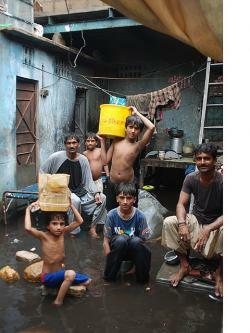 You will notice in the above photo that the stairs to the river are still visible. This morning, they were covered. This park visitor perched at the top to capture a photo of the rising water. The current is very fast and there's still quite a bit of debris flowing along. Barges have been placed in front of the Padleford boats to protect them from debris. Here's a video of the current and some of the debris that has been blocked from banging the boats. It will be interesting to watch the water this week. If you are in St Paul to watch the flood, stop in to the Mississippi River Visitor Center in the lobby of the Science Museum and chat with a Ranger about it.